Working in the SEO industry, with a focus on On-Site SEO, Brandon is a top-rated Upwork SEO specialist. Learn SEO with him. This HubPages on-page SEO guide is written to help writers on HubPages who are interested in increasing their "organic traffic", with a key focus on increasing traffic from Google, the search behemoth. 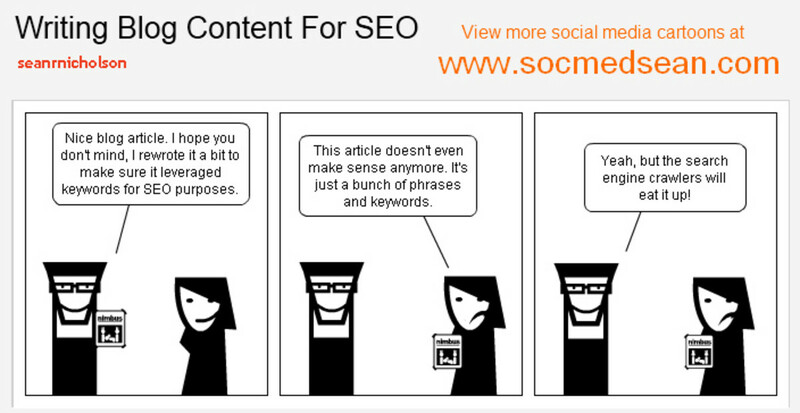 Before you go ahead you should know that on-page SEO and SEO, in general, is not set in stone. Some things that work today, may not in a few months or years from now. Writing online is not a passive source of income, not completely. Also, this hub is not a tutorial, but a guide. It's not steps you should follow, but rather a process that I suggest. I have extensively used my hubs as examples throughout this guide, not to say my hubs are perfect, but to prove that the methods I talk about actually work - today! I've linked to my own hubs to serve as examples when I talk about a certain concept. It's easier shown than explained in many cases. You may find yourself hopping back and forth across 5 - 6 different hubs of mine while you learn from an SEO nerd. You're also going to find links to hubs from other authors here on HP who've already extensively covered certain aspects of On-Page SEO. I don't have any intention to reinvent the wheel. What Would You Learn from Reading This Guide? If you begin a new hub just because you've got a topic to write about, you're doing things wrong. Most people start new hubs before doing their keyword research and therefore forever lose the opportunity to optimize their URL for their main term(s). Please take some time to answer the poll below before proceeding. How Often Would You Say You Start a New Hub Before Doing Your Keyword Research? If you've done this in the past, there is very little you can do to change this, so do not worry too much about it. But, for all future hubs and for hubs that you're planning on re-writing from scratch, I suggest that you do your keyword research before you click "Write" to begin a new hub. From the above list of keywords, I see that there are two really good keywords that would be perfect for a how-to guide. This is exactly the kind of article I wanted to write! Those are my little golden nuggets. I'm going to pick the keywords: how to get rid of termites naturally and how to get rid of termites yourself as my main keywords. When writing a URL you should make sure that you remove any words that are not directly adding to the URL, either in terms of SEO value or reader aesthetics. In the URL above I have retained the stop word 'to' but have left out the word 'of'. That's just my personal taste. Do not worry too much about stop words, the goal is to try and get your main keywords in the URL as close to the start as possible, while still retaining its readability. This URL has the same keywords, but it does not read well. If search engines are not smart enough to detect this today, they will someday and your page could be hit by a spam penalty. And the URL is not something you can change here on HP, so refrain from doing something like this. Do not repeat the same word in your URL more than once, not even synonyms. For example, this is a bad URL: ../tomato-seedlings-growing-nurturing-and-caring-for-tomato-seedlings (from one of my hubs). Problems with the above URL: The word tomato and seedlings repeat. Having a short URL is always beneficial. Try and keep it as short as possible, while putting in your most important keywords. A short URL looks good on the search results page and your keywords are highlighted when someone searches for the term making it stand out. An exact match URL (exactly the same as your main keyword) is always the best way to go. It is also my personal choice to not exceed 6 words in the URL (as far as possible). I had secured the following URL: https://hubpages.com/living/how-to-care-tomato-plant (a better URL than I previously had) and had written a completely new hub here as the old hub (../tomato-seedlings-growing-nurturing-and-caring-for-tomato-seedlings) which was on the same topic was not receiving a lot of traffic. Since the old URL belonged to a hub that was moved to Dengarden and I didn't want to compete with myself for the same keywords, I requested the team to delete the old hub off Dengarden and replace it with the new hub that I had just published. However, Joanna (the editor I contacted) conveyed this message to the team (I'm thankful that she did this). Some time later Robin, being the helpful person she is, suggested that I do not delete the old URL and instead have two articles on Dengarden (not on the same topic) if possible, because the old URL had age on its side (2011) and we all know that Google loves aged URL's. This sounded really good, and I went along with it. I took this sound advice and decided to copy the hub from that new URL onto the hub that was already on Dengarden, thereby replacing it entirely with a brand new hub on an old URL. As you have now learned, this URL is not the best. It's now a few months since this was done (as of June 2018). Am I happy with this decision? Of course, I am. I learned a lot from this move. It was definitely the best way forward. However, the rankings are not what I expected, especially for a detailed hub, one that I am particularly proud of. Google is not smart enough, not yet: Google is becoming smarter every day, but it's not yet smart enough to consider an authority "all-in-one" article as the go-to article for all the sub-topics it covers. I talk about everything from picking the right kind of seed, to sowing, caring for and transplanting tomatoes in that article. The title "Tomato Plant Care: Seed to Garden (A Complete Guide)" does convey the message very well, but I do not have all my main keywords in there. There's no mention about transplanting in the title, there's neither a mention about this in the URL. Google still needs your main term or the direct subject mentioned in the URL and title tag for it to rank really well. Website authority plays a role, but unless the website is super authoritative, don't expect to rank at #1 with a tactic like this, not yet. I rank on page 2 for the term "transplanting tomato seedlings". Had this article been on a smaller site with less authority, this extensive article would probably not be in the top 10 pages for this term. The same article on Wikipedia would probably be in the top three spots. Internal links: There are no internal links pointing to this article that lets Google know that this article does in fact truly speak about transplanting tomatoes. I do not link to this hub from any of my other hubs with the term transplanting tomatoes or synonyms of the same. Internal competition: commonly known as keyword cannibalization, this is something you do not want to have to fight, not on HubPages, anyway. Managing this on your own website is a breeze, but on a platform such as HubPages where everyone can write on any topic, these problems are bound to occur. I found myself in this situation with this article. For the main keyword, I was after, which is "tomato plant care". If you search for this term, you will see that my article on Dengarden currently shows up on the second page. Just above another article, also on Dengarden by Kryssy Bruckheimer (see the image below). Keyword cannibalization - Oh oh! When two articles from a particular domain try to rank for the same term, Google makes it harder for any of them to rank, this is a logical move from the search engines point of view, because if a website has multiple articles on the same topic, they are probably not stand alone articles that cover the topic entirely. 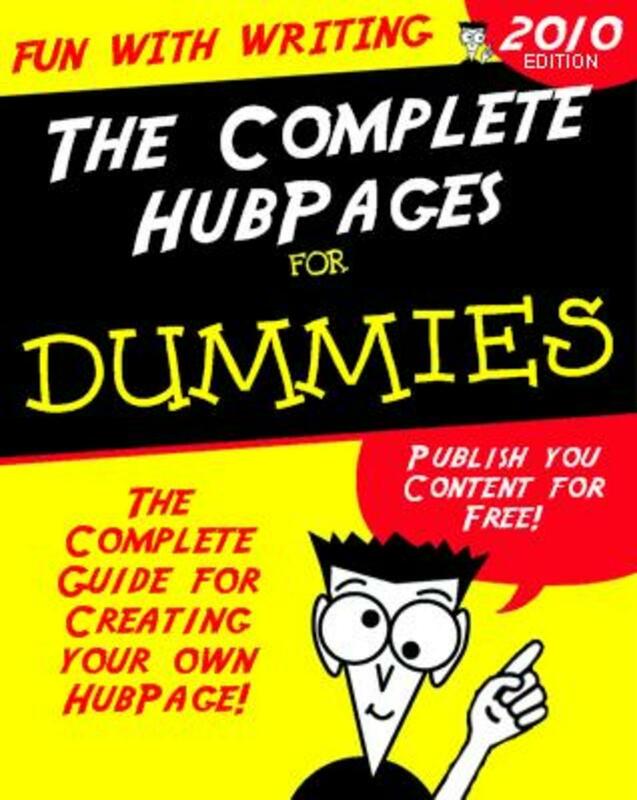 But when it comes to HubPages, this works against us and there's nothing we as authors can do about it, or is there? HubPages on their own does a good job at preventing very similar articles from moving to the niche sites, but the same keywords can be written about from different points of view, and this also (unfortunately) leads to the same issue of keyword cannibalization. There are plenty of free tools out there for keyword research. You just need to know how to use them. I mainly use SEMRush, which is a paid software and the best for keyword research among other things (Ahrefs is another amazing tool). But to cater to the need of most hubbers, I will explain the process using some amazing free tools which provide the same results as the paid tools (with a little bit of work). The only reason I use SEMRush is that I already have an account because I use it to track client keyword rankings and find out the keywords a page is already ranking for. Finding out the terms a page already ranks for is very helpful and was the report I provided a few hubbers through my post on the forums a few months ago. A free tool by Neil Patel, Uber Suggest uses both Google Adwords and the Google Suggest feature to suggest short and long tail keywords. All you need to do is enter your main keyword (the topic you want to write about) and click "Look Up". Once the keywords are generated, make sure that you scroll down and see that both the Google Keyword Planner and Google Suggest are ticked on the left sidebar. It is very likely that some terms are not directly related to what you want to write about and the topic you want to write about does not show on the top at all. To fix this problem use the Filter Results and Negative Keywords options on the left sidebar. For example, I typed in watering tomatoes as my main keyword. I see keyword suggestions such as best fertilizer for tomatoes. But I do not want to write about fertilizers at this time, so I add the word fertilizer as a negative keyword. Moreover, I am only interested in the keywords that are directly related to watering tomatoes. So I add the word "water" in the filter results option. After I have removed the main keywords I do not want to see, I sort the results by search volume. I now see "water plants", "water machine", etc. as suggested terms. Those are terms I am not interested in. But if I add plants as a negative keyword I would miss out on the terms such as watering tomato plants. To help me out, I just use the ctrl+F function on a windows computer and type in "tomato" to highlight terms that include water + tomato (water is added in through our filter and tomato through the search function). Alternatively, I could add tomato to my filter to include terms with the word tomato in them. This alone gives me more than enough suggestions. Create a spreadsheet or some sort of document to note down the main keywords you want to use. I was re-introduced to Uber Suggest only recently by DrMark on the HubPages forums. Also, the tool is about to get a makeover, I can't wait for that to happen. It is supposedly going to have the main features of SEMRush and Ahrefs too. A new tool that I recently found, Answer The Public (ATP) is one of my favorites, even though I have not had the opportunity to use it a lot. Just go to the website, type in your main keyword (the topic you want to write about) and scroll down to look at the suggestions which are sorted as questions, prepositions, comparisons and as an alphabetical characterization. I am not going to explain what these mean, go check it out yourself. It's really cool. It could probably replace Ubersuggest if it included search volumes, but there's no harm in using both tools. The more the merrier (to some extent). Put in long tail keywords from ATP into Ubersuggest if you need to know the search volume. Alternatively, put in some keywords from Ubersuggeset into ATP to get suggestions on headers you could use for your article. Now that you've got a list of short and long tail keywords, questions (from Answer the Public), and a general overview of the things people are searching for to learn about the topic you wish to write about, it is time to develop the skeleton of your article. Put yourself in the shoes of your readers, do not overwhelm them (read this post for a discussion on this). You want to give them all the information they need, but in a way that is easy to assimilate. As an expert on the topic, it is sometimes hard to do this. The best way to do this is to group similar keywords and questions together. The questions could most likely be your sub-headings. Try and use your main keywords in your headings and also H3 tags within a text capsule on the Hub Pages editor. Do not ever keyword stuff, think of your work as a research paper (or chapter of an academic book) and structure it accordingly. 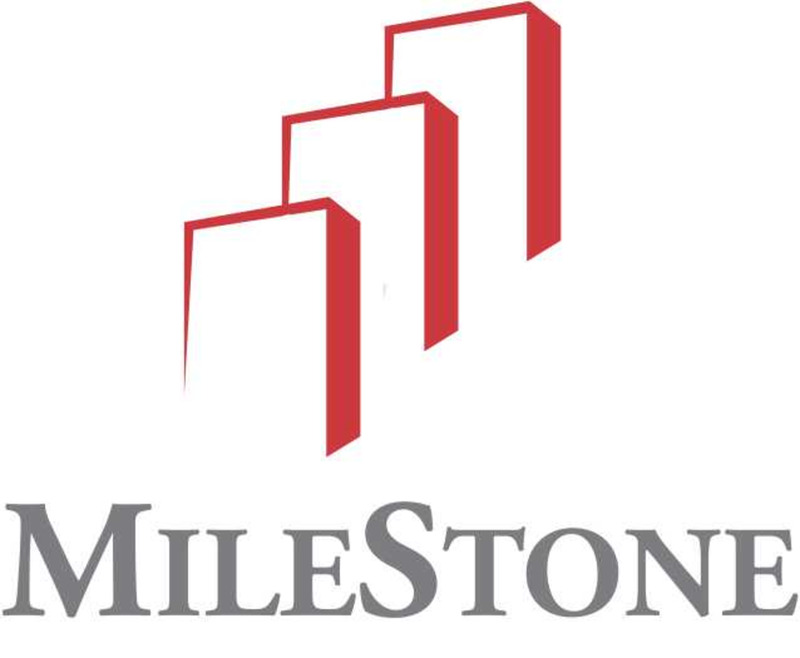 Most people say that an article must be 1500 words up to 3000 words. But don't fall for that. Sometimes the staff have said that the best hubs are around 1500 words. People take this as the holy-grail and try to reach this word count. It is NOT word count, but content that matters. These hubs that are 1500 words most likely cover their topic perfectly and are therefore ranking well and getting the traffic. Sometimes a topic is so well defined that you can not cross 500 words. At other times you may even reach 5 - 6000 words or in this case I'm almost at 9000 words. You could in most cases split the 6000-word article into two hubs, but not always. For instance, I'm going to be splitting my article on growing tomatoes, but this HubPages SEO guide is very long and I cannot split it without making my readers jump through a hoop to completely get what they came here for. Also, my hub on how do magnets work is over 3000 words, but it's not complete, I need to re-write it and add a lot more to it. There is no way I can split this up without the readers having to read two articles to answer their single simple question: how magnets work. On the other hand, when to water tomatoes could be a hub on its own, but I chose to include this topic on my watering tomato hub which originally just covered watering techniques. I did not split this into two hubs because they are so closely related that the search engines would get confused as to which page to rank for the term watering tomatoes since both the pages talk about this (keyword cannibalization). To sum it up: do not aim for a word count, instead aim to cover your topic entirely. The person searching should not have to go back to the search results and click on another web page. When a viewer does this, it is theorized that this acts as a negative signal to search engines. I do believe this is true. From experiments, I have noticed that pages with a relatively high user satisfaction rate do in fact move up the rankings over time, i.e. once they are on the first page. This is probably because the bounce rate (a click back to the search results page) from these high-quality pages is a lot lower than some of the other pages ranking for the particular search term. The experiments were conducted very well, I'm not going to elaborate more on this here. You're going to have to take my word for it, but rest assured that many of the other top SEO professionals have seen similar results. There are two types of people who do well here: Experts on a topic and those that know how to do their research and present the topic well. Imagine the potential traffic you'd have if you fell in both these brackets. Even if you are an expert and have a postdoc in a subject there is no way for search engines to know this. Google did try to do this with their Google author tag. But this is depreciated and not used anymore. You need to, therefore, prove to the search engines that you are in fact an expert on the topic. It's not hard, but it is time-consuming. By now you have a well-defined structure with each heading focusing on a particular keyword or keyphrase. Type in this keyword or keyphrase on Google and take a look at the first 20 results for this term. Read the articles that show up, what are they talking about that you have not planned on putting into your article? For example, when writing about watering tomatoes, I realized that some of the top pages spoke about enlivened water. I do not believe in this technique, but Google seems to rank pages with this information on the top. So I decided to include it along with my own take on it. You don't have to write something you do not believe in, but know that your readers are going to be reading many articles on the internet and as an expert, you need to address all their concerns. It's very likely that someone reading my hub wanted to know about enlivened water, I did have a few comments that discussed it too. Repeat this process for every subheading and of course your main keyword. Most of the pages ranking are going to be the same for the different terms you search for as they are all related to your main topic. Therefore, you're not reading 20 pages for every secondary keyword. But, there will be a few new pages every now and then and you would probably come across some pages that talk about your topic from a completely different perspective. To state another example, check out my hub on whether the tomato is a fruit or a vegetable. I found just one sentence on Wikipedia that spoke about the canning industry and how it defines the tomato. Just one sentence. But I wrote a paragraph or so on this after doing some more research. Therefore, I can definitely say that this hub of mine is for now truly the best on the internet for this topic. This is your goal: Make your article the very best on the internet for the topic you are writing about. This, in most cases, is going to lead to long articles, but not always. Some of you are going to be saying that people have a short attention span these days. That's gibberish from people who don't know how to deliver. If you write well, people are going to be engaged. People do have a short attention span, but that's just for things they do not like. If you're helping them, they're going to stick around. However, when you write detailed articles, it's very likely that someone is not interested in every single point you cover and they may be interested in just one of the ten things you've discussed. Make it easy for them to find this one thing. Structure your content well and include a table of contents when possible. I cannot stress on this topic enough, I have seen the best ROI on time invested by adopting this procedure to make my articles the best on the internet. Most of my articles are not up to date using this method, but the ones that are, are the ones that are doing the best. Thousands of visits a day each in some cases during peak season. I am not saying that every hub of yours will rank #1 if you follow this technique. Instead of the 80-20 rule where just 20% of your hubs do well, you could be tipping the scales in your favor, to say 50 - 50, on a very very conservative scale. As discussed above, keyword cannibalization is not that easy to solve on a website where you do not have a 100% control over all the pages being published. HubPages makes sure that multiple articles on the same topic do not get through to the niche sites. But, it's very possible that two articles written in different ways compete for the same keywords. If two authors are writing on the same topic, how do you make sure that it is you who is getting the traffic? Rather, how do you make sure that either you or your competition here on HubPages gets any traffic at all? As you have seen above on the image where two Dengarden articles rank on the 2nd page both of them have a hard time ranking. When Google sees two pages on a website talk about purple pigeon poop (credits to Wrylilt for this keyword), say page A and page B it doesn't know which page to rank and it is most likely of the assumption that neither A nor B are good enough because there are two pages talking about the same thing (I know I'm repeating my self here, but I cannot stress on this enough). If you cannot get rid of one of the pages the next best thing to do is vote on the page that you want Google to consider. But how do you vote? You use links! Internal links. If you were an authority on poop or on pigeons you'd have many articles on the topic and hence you're more likely to interlink your work. If page A belongs to you and page B to someone who just wrote one article on purple pigeon poop, it is very unlikely that page B would have many internal links. My solution is simple, become an authority in your niche. The more you write, the more you'd interlink your work with relevant anchor text and therefore you would outperform your internal competition. 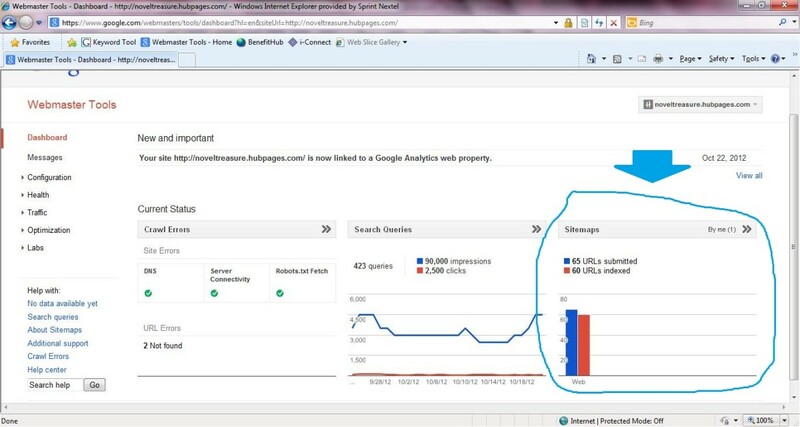 Internal links when done right are a lot more important than backlinks. Think of it like this: Say every article you write is a cup with an infinite capacity to hold water. The more water you have the more authority your article holds. Every website has a certain amount of water that is held by the many cups in its shelf. Backlinks to a website, to any page (cup), are like pipes bringing in water. The better the backlink (authority of the website linking) the more water flows. But, for the water to flow well within the shelf (on the website) the cups need to be connected by pipes (internal links). Now imagine that you add dye to this water. Red dye is for tomatoes and a green dye is for herbs. When I have many pipes flowing into my cup (tomato hub) I have a chance of getting some green dyed water too, I'm happy with all the water I get. But I would prefer more red-dyed water than green-dyed water. I can get more red-dyed water by sharing (sharing does not take away from your cup) the red-dyed water from my other tomato hubs so that I have a greater percentage of red dyed water in my cup [read note below]. This tells Google that my hub is an authority on tomatoes because I have more water than the other page that talks about the same keyword and in particular I have more red-dyed water. Note: My tomato hub (cup) has a source of red dye powder on the pipes leading out, so I convert all of the green-dyed water into red-dyed water if the water ever flows out to other hubs (cups). Don't let the QnA feature take you down. Don't answer questions that are already covered in your article. This can lead to keyword cannibalization too. You can't help lazy people, let them learn to read. The question and answer feature is a great new tool added by HubPages, however, the way it's implemented is not the best. The moderation on the answers is not as strong as the moderation on the hubs on the niche site. But, that's a problem for HubPages to deal with. Having many low quality pages is not a good thing, and the team has a lot of experience with this already. Make sure that the question does not have keywords you are targetting from your hub. You do not want to have the URL and H1 tag of a new page on the niche site to be in direct competition with your main hub as this leads to keyword cannibalization. Most questions, at least the ones I receive are mainly opinion pieces asking for my take on stuff or for something that is not mentioned in the hub but could be related to the topic. There's absolutely no harm in answering such questions as they actually increase your traffic and ad impressions because other readers are very likely to click on these questions and maybe you could also get some search engine traffic through them. The only thing you as a hubber need to keep in mind is keyword cannibalization when dealing with this feature. Every other thing is up to the team to deal with. Most of you may not know much about the search snippet. It's not a new feature, but it's not very old either. It's been a few years now, I guess. If you rank on the first page for your search terms you're going to want to steal the snippet as that's the highest spot on the search page you can get to. Note: This can be a very volatile place to be, so only ever worry about stealing the snippet if you're really looking for good traffic. You may have to edit your hub multiple times before actually getting it, and once you have it you could lose it and the cycle continues. As you see above, I've taken over a part of the snippet. I already ranked #1 for this term, but it took me a little more time, effort and patience to get the snippet. Notice that there are two websites ranking on that snippet, one for the text and one for the image. You can, of course, grab them both, that's the goal. You'll notice that the two snippets have a totally different format. One is information in the form of a paragraph with a picture, whereas the other is a table comparing stuff. There are a few different kinds of search snippets out there. For reviews and comparisons, you're probably going to need a table to take over this spot. If you're writing informational articles you would need a picture with the right "alt text" or on HubPages, the right caption (the alt text is a copy of your caption here on HP). How Do You Steal the Search Snippet? Structured markup is the key to stealing search snippets. But, there are some general guidelines that you are advised to follow based on observations I've made and the research I've done. 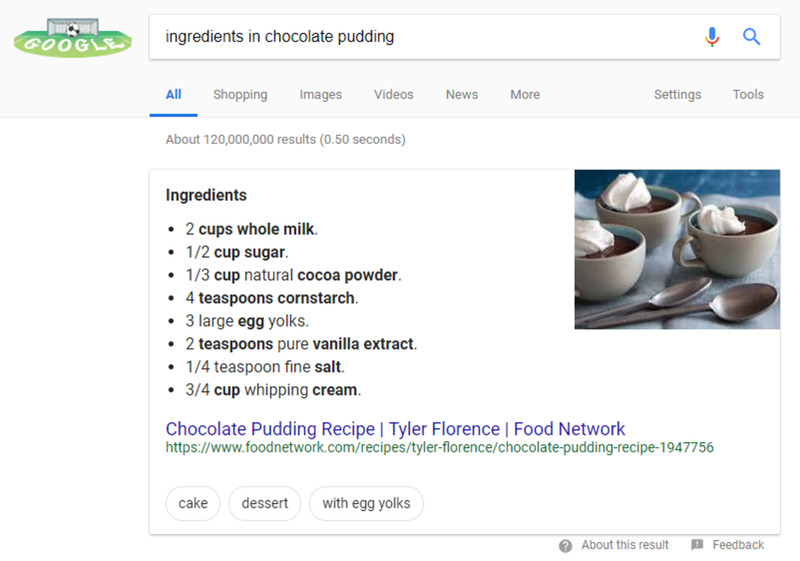 Unordered lists are the go-to markup you should use when you are listing things that are not sequentially related to one another, for example, a list of ingredients or when you are answering questions that could have multiple answers, or when you list out the health benefits of something. Ordered lists are used when you are listing something that must be followed in a sequence such as a recipie or the steps to follow when installing a kitchen sink. A table of contents in an ordered list is a very important feature to have on your website. I have discussed this in detail later. As you have already seen in a picture above, my article for the best wall mounted range hood has the search snippet for a few terms. This is a review article and when people search for reviews Google understands that most people are going to be interested in comparisons. Therefore, if you're doing a comparison, a review of any sort, listing the nutrition information of a fruit/vegetable or a recipe use a table to do it. If you notice that Google shows a table as the snippet for one of your search terms and it is not you ranking for it, check out the way the person uses the table. Are they sorting data by rows or columns? Copy their style when possible and do the same. There are certain phrases where Google prefers that the data is sorted by column and in some other cases the data should be sorted by rows. Again, if you look above you can see that I have stolen the snippet for yellow tomato leaves. To do this you're going to have to put your main keyword into the caption of your first image (preferably). Of course, make sure that you write a caption that reads well to your readers, else it's just going to be snipped by HP. Also, once you put in your main keyword into the first image, check out the captions of the other images on your hub. Try to ensure that no other picture mentions the keyword in the same order of words. It's some sort of keyword cannibalization for images because each image tries to rank on its own in Google image search. De-optimize other images by using filler words or synonyms. After around two weeks of making these changes to your images, you should go to Google image search and type in your main keyword. See the images that are ranking, if you notice that an image other than the one you added the relevant caption to is ranking higher than the one the caption is added to, switch your focus and try to get the other image to rank by working on its caption and de-optimizing the originally optimized image. It's my opinion that an image other than the one you've optimized for ranks well when it's got many backlinks pointing at it, mainly from Pinterest. You could also alternatively do an image search before you optimise your images to find out which of your images ranks best and work on that one directly. But all things being equal (no links to any images etc.) the first image should rank the best. So keep this in mind when writing new hubs. It is therefore wise to make your first image a made for Pinterest (MFP) image. An MFP image is a good image to have in a snippet (see my yellow tomato leaves image) and it has the potential to get you shares on Pinterest, thereby helping it rank better and eventually getting you that snippet. Finally, it's been observed that the image in the search snippet is from that image that ranks first on Google images provided the web-page the image belongs to ranks on the first page of the search results for the regular (not image) search of the same phrase. If that website is not on the first page, the second image shows on the snippet and so on. Very often the search snippet has a heading, whether it is a table or just text and an image. This heading is taken from the article and it's usually got the keywords in there. 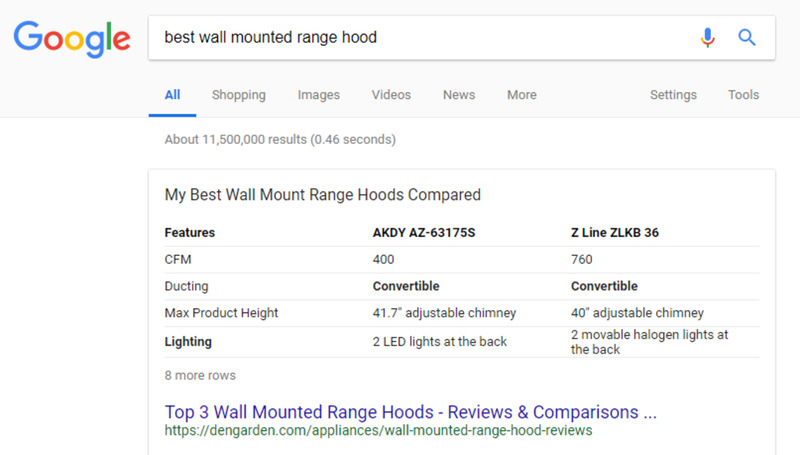 If you look at the screenshots above you can see the following headings show: "My Best Wall Mount Range Hoods Compared" and "Natural Termite Control". Therefore, when researching your competition to try and out beat them for the search snippet, check out the heading that is ranking and the kind of text under this heading. Does the article directly go into bullet points below the heading, maybe a table or do they have a short paragraph and then a bullet list? Is their keyword in the paragraph that follows this heading that Google is picking up on? With all of these things, you're trying to emulate and not copy your competition. Google treats every phrase differently, that's why it's a smart algorithm. You are not trying to copy your competition when you are studying them, you are just trying to understand the kind of content Google wishes to see for the particular search term. I intend on heavily editing my hub titled: "How to Get Rid of Termites Naturally" and before I edit it, I saved a copy of this page on the way back machine so that future readers can also see what the hub looked like, else the following example will make no sense in the future. The following is going to be a series of statements on the changes I intend to make and why I choose to make them. The logic behind every change has already been explained above. This serves as a tutorial based on the lessons learned above. It would be a wise decision to check out this hub and think for yourself on the kind of changes you would have made and then compare it with my decisions. One day after I have re-written the hub and make it the best termite treatment resource on the internet for natural termite extermination, I would add a number to the title to serve as clickbait. People are more likely to notice it when it stands out, and numbers do stand out. I would want to retain my main keyword, so I would probably go with something on these lines: How to Get Rid of Termites Naturally (6 Ways to Kill Them). This is a really good title in my opinion because it's got my main keyword and it also includes the word kill. The word kill is present in a few secondary keywords I am targetting, a small list of some of my chosen keywords are found right at the top of this article. Other than having the right words and being grammatically right, this one uses parenthesis and numbers, both serve well for the title to stand out. For a discussion on when and how to use parenthesis in your titles, check out this forum thread. Lastly, it's 58 characters and would show completely on search without being truncated. You were convinced that it was a really good title, weren't you? Of course, it's a good title. But is it the best I could come up with? Nope! I have an even better title here: How to Get Rid of Termites Naturally (6 Ways to Do It Yourself). It still retains both a parenthesis and a number for improved click-through rates. It's got both my main keywords in there: How to get rid of termites naturally and also how to get rid of termites yourself. I have lost the word kill from the title, but that shows up a lot in the article, I decided to target my main keywords with one of the most important parts of my article. I can now safely get rid of the heading (Get rid of Termites yourself!) right at the beginning of the article because this keyword has already been covered in the new title. This is a recommendation to go by, begin your article directly and don't include a new header at the start. Most books or research papers do not begin with an <h1> tag immediately followed by an <h2> tag. There is almost always text in between. And we know that Google wants articles to be scientific and factual, this is one way to do this. This is also why HP requires you to include references and links to references when writing on caloriebee and the other medical related niche website. For more tips on how you can improve the title of your article, check out this hub. It is absolutely fine to add a linked TOC. Ideally, we would have a feature for this. That's not her entire reply, she went on to say that they are super busy with the Maven acquisition and we all know that there are many other things they plan on working on. So this may not be a feature any time soon. She did add in a word of caution though, she says that if you do this manually for all your hubs you would have to work on all of them again to remove it if they ever add a feature for this. I would, therefore, suggest you create a new text capsule for your TOC so that you can easily delete it if it ever comes to that. You could easily delete 60 TOC from 60 hubs in an hour, conservatively speaking if you can delete an entire text capsule without thinking twice. I personally would, therefore, choose to include a table of contents on all my hubs (when applicable) as there are quite a few benefits to having one in there. Of course, only add one when it adds value to the reader. When you do this to help your reader you can be smart about it and make sure it adds SEO value too. How Does a Table of Content Benefit You? Navigation: First and foremost it serves its true purpose, as a navigation on your longer articles, helping your readers get exactly what they want. When your readers get what they want there's going to be a lower bounce rate and this is known to influence your rankings positively. Sub-Articles: For lack of a better world, this gives you the opportunity to add sub-articles within your hub. I only say this because Google sees it this way. When you link out to your sections using the right keywords, Google shows this as a link on the search results for relevant search queries. For instance, if I had an article on Termite control and I covered chemical and natural ways to do it. 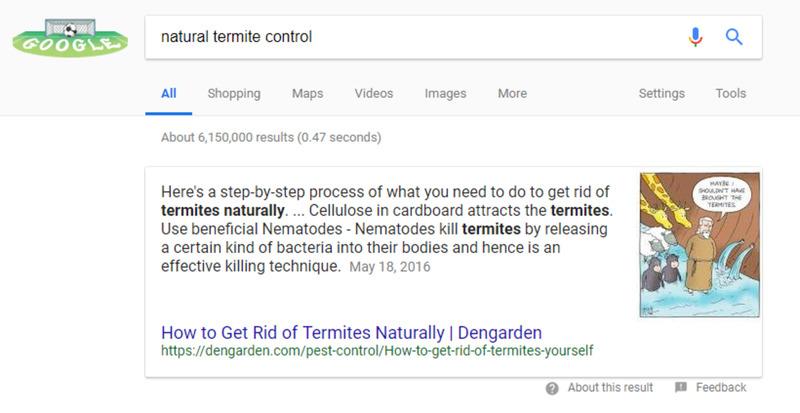 Google would show my article on the search results with a link to "natural termite control" just before the meta description. Most users are not going to click on that, but the very fact that Google understands this implies you have higher chances of ranking for this term. See the image below, it's self-explanatory. This is what I see for the term "get rid of termites naturally" today the 15th of June 2018. Below the top two results (indicated by the leftward pointing red arrows) are sub-links below the meta description. All of these links are extracted from the table of contents. Only the first two results on this page showed these links and just these two pages have a table of contents on their pages - coincidence? I don't think so. 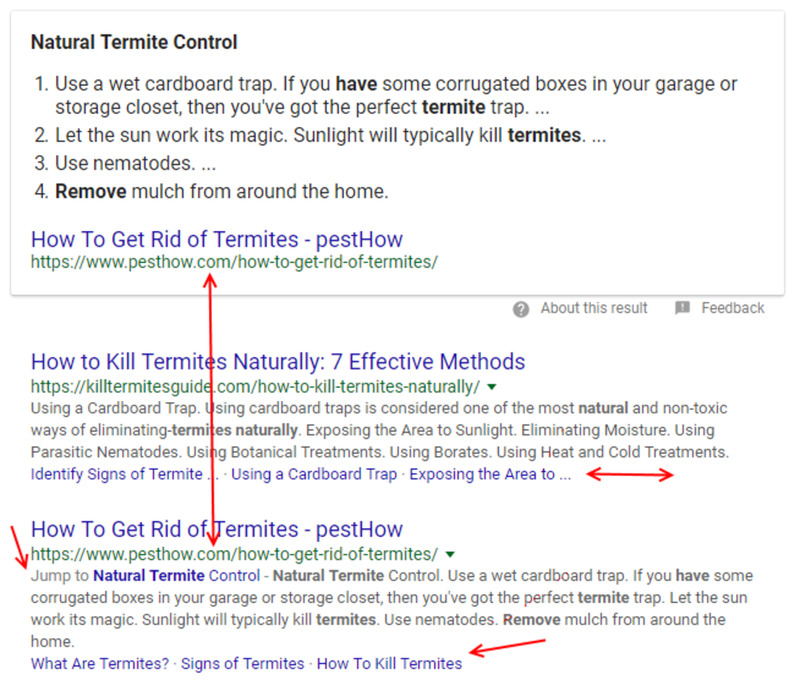 Also, you can see that the second article has a jump to "Natural Termite Control" link before the meta description. The first article does not have any link in its table of contents that links out to natural termite control or killing termites naturally, because the entire article talks about it as indicated by the title. So there is no jump to option. This is a great way to get highlighted for your secondary keywords. Finally, notice that pesthow.com has the featured snippet. They have a link in their table of contents that takes me to the section Natural Termite Control. Google understands this very well and therefore this page ranks on the snippet and not the website killtermitesguide.com for this search term. So, are table of contents underrated by most writers seeking an audience from search engines? Yes! It's no surprise that Wikipedia one of the most visited websites has a table of contents on every page. They are very helpful in many ways. First, follow my advice and structure your article well and use your main keyword in the title and your secondary keywords in your headings. Link out to your secondary keywords using just the keyword. For example, within your article you may have a heading: 4 Ways to Get Rid of Termites Naturally. Do not include this in your table of contents as it is. Your secondary keyword, in this case, is get rid of termites naturally. So use just that in your TOC and link out to this section. It's both short and delivers the message. Your table of contents must ALWAYS be on a numbered list. For guidance on how to create a table of contents, check out this hub. Not every link in your TOC needs to be keyword based. Also, don't forget to be helpful to your readers when you create it. Your TOC does not need to have a header called Table of Contents. I do not have such a header on my website and I have the jump to section links and also search snippet positions. Of course, this is just me trying to give you a quick intro into the best TOC. The image below is a TOC on one of my hubs. I just noticed that most of the images in this hub do not have image captions and therefore they do not have image alt tags. It is therefore not a surprise that I do not rank on the snippet with an image from my hub. I would therefore, think of good figure captions such that my main keywords are in the caption of the first image. I noticed that the image with Noah and the ark ranks the best. However, I intend to delete that image as I don't see a lot of Pinterest traffic to this hub because of this image (the reason I added it). Also, if this image shows up on the snippet it won't compel people to click, unlike the image on my hub that discusses yellow tomato leaves. Therefore, I would delete this image and replace it with a better image that would make people want to click on it in case it shows up on the snippet. I would definitely do my keyword research again and structure the article based on my keyword research keeping in mind all the points discussed here. Also, I will make sure that I retain an ordered (numbered) list as Google shows an ordered list on the search snippet from pesthow.com even though they have an unordered list on their website. It is not common that Google changes the kind of list. 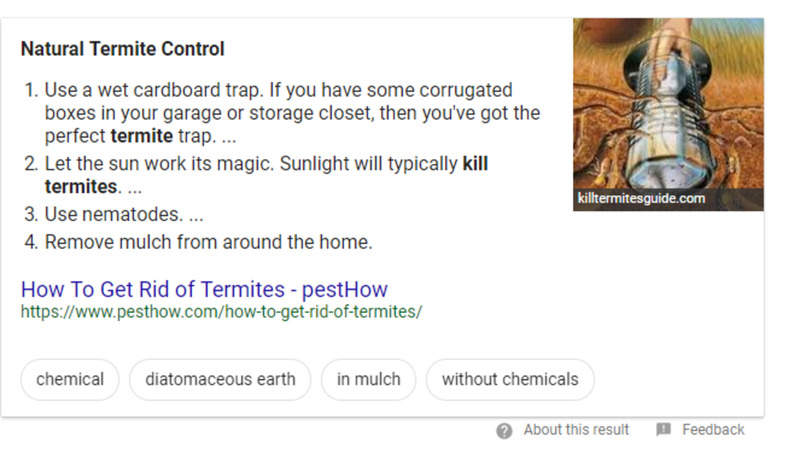 This is a good indication that Google expects to see something on the lines of "steps to exterminate termites naturally"
I would read through the first 20 results for every keyword I am looking to rank for (as discussed in this article) and include new points when applicable. For instance, I would write about orange peel, I heard that's good. I'm sure some websites talk about it too and I should come across this when I look into the top 20 websites for this term. It's not always your main keyword that ranks well and gets the search snippet. It is therefore wise to check out your secondary keywords too. I have the snippet for "natural termite control". My image of Noah ranks #43 on Google images when I looked, but the top 42 images do not come from any website ranking in the top 10 results for this term, whereas Dengarden ranks #3 for this term. Note: This is before I have edited the hub keeping in mind the points I just listed for the edit of this hub. I have the snippet for natural termite control, today the 16th of June 2018. This is before I edit the hub to make it the best. I am browsing privately, for those of you wondering. Now that I have explained the methods I use, I think it is necessary that I prove that they actually work. If you do read the suggestions and techniques, it's pretty obvious that they would help, but for the skeptics out there and for those interested in seeing some numbers, below are a few results that I have obtained. This article on Dengarden was the first article that I worked on with the sole purpose of increasing its traffic. I began making some edits to this hub sometime mid-January if I remember right, and as seen from the date of this post on the forums. You may also be interested in this follow-up thread keeping track of ranking changes to certain keywords I had an eye on. It is clear from these threads that I only worked on increasing the rankings of a few keywords (7 keywords), but thanks to the improvement of the article in general, some other terms also saw an increase in ranking (I kept track of 14 keywords in total). I must admit that this hub is still far from being the best. I got a big checklist of things to do on this hub, right from re-structuring, adding a table of contents and of course adding new information to expand on certain sections. But according to SEMRush, I rank #1 for every term I would want to rank for, there are no ranking improvements I can get for this hub. I just need to steal the snippet now. Rankings take a while to stabilize after on-page changes have been made. From experience, this can take anywhere between 2 weeks to 2 months on average. Therefore, I have waited 2 months before I began writing this guide. Since the results have stabilized over the past month, with no significant changes, I am comparing the organic traffic of March 2018 with that of March 2017. An increase of 388.07% is seen thanks to the addition of a little helpful information to the hub. Note: These are winter and early spring comparisons. I expect this to increase significantly, maybe around a 500% increases in summer 2018 compared to summer 2017 as that is the peak season for most gardening hubs. P.S: Keep in mind that there was also a very important Google update on March 12th, which has helped most of the niche sites. Using data from SEMRush some niche sites have seen increases of around 20 - 50%. It is safe to assume that the overall increase is around 7 -10% considering this post on TheMaven, that shows the unique visits to the network would grow by a forecasted 10% in March when compared to the time Maven and HubPages merged. This update by Google has also definitely helped my hub, but, when you compare 388% on this hub with the average of 10% across the network it is clear that I've done something right. Clarification: I am comparing my organic traffic with forecasted unique visitors, but this is not a problem as most people come to this hub via search only once and are therefore unique visitors. The methods mentioned here do not just work on HubPages but can be extended to your own websites and blogs. I worked on a single page of my website using the techniques outlined in this guide, and that page saw a 421.48% increase in organic traffic comparing January 1st - March 27th, 2018 vs the same date range in 2017. The website has otherwise been idle and I have not made any other changes to it during the entire year. @Siny, yes, Uber Suggest is a pretty good free tool out there. @Farrah, internal linking is key on any website, the fact that HP does not do it is why you would want to do it yourself. Good luck and thanks for writing in. If i didnt learn anything from this hub, I learnt about internal linking to combat keyword cannibalization. Thanks for this very detailed post, Brandon. Enjoyed the read. Uber suggest is a good tool. I like it. Thanks for sharing it with us. Happy to help Khal, good luck with your articles. 5 months ago from Penang but occasionally traveling. Thanks Brandon especially on effectively using keyword research, creating an URL, structuring an article, and word count. You can find articles about the four areas mentioned here and there from the web. However, you put it in one article and connected the dots for me. Your article is a BIG HELP for my future articles and updating my older articles. Thanks again! Thanks for the feedback Lisa. Amazing article! I have saved this and going to follow all these ideas when updating and adding another. Very informative and very detailed. Hi, Ellison, you are welcomed. Have a nice time on HubPages. Thanks so much for the link, I appreciate it! You will find all that will make your writing a success. Good luck, and thank you. 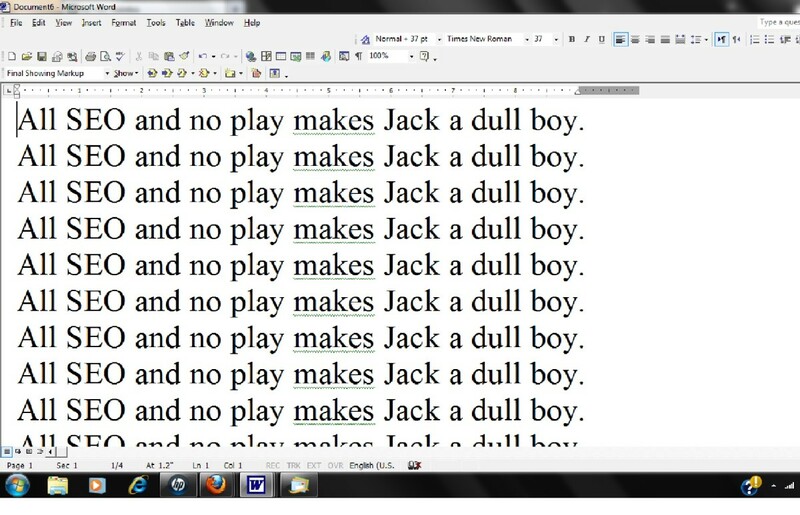 Welcome to the world of online writing Ellison. Good luck! What a great resource! I'm new to the whole online writing thing and I think I produce good content, but I have a ton to learn about how to get more traffic. I will figure it out one of these days, I will definitely use this article as a reference though! Thank you so much! I know this will be very helpful! Nice :) You're welcome. Good luck getting that new article moved to a niche site. @Brando, I've studied the table of content as you depict it in and check the Wikipedia table of content also. Now, I understand the question. I recently finished a new hub, and I am in the process of reviewing it for correcting grammar, spelling, sentence structures, and punctuations. Although I've been studying how to handle the title and keyword, I will now incorporate the table of content in the new hub. Thanks for your tutorial. Thank you!! I have been struggling to figure out Google Analytics. I'll go back and check the section you mentioned. I must have missed it. @Victoria, I did include a link to another hub that explains how you create a table of contents, it's under the section "Writing a Good Table of Contents"
I use Google Analytics and SEMRush and a regular incognito search of the terms I want to rank for to check rankings and stats. Thanks, RTalloni for taking the time to comment. Feel free to ask questions if you've got any. Thanks so much. Will have to reread at least a couple of times to absorb it all but the very first read gave me info to use. Appreciate that you share info and experience. That was a very thorough article but I didn't see anywhere how to create a linked table of contents. How do you get your toc to jump to different sections of your article? And then also, how are you seeing all of this ranking stuff. I thought I knew SEO, but now I feel like such a beginner. Hey Sherry, thanks for writing in. Welcome back. I was away for exactly 2 months too, immediately after writing this hub. Brandon, this is a very helpful hub. Being away from HP for two months I missed many updates including this one. Thankfully, I got to read it today. Great work! Thanks for the feedback Natalie. I'll keep adding to it and making updates when applicable. I'll post a comment whenever I update it so that people following it know about the update. I keep coming back to this article for help over and over. It's such a wealth of information! 9 months ago from Port Harcourt, Rivers State, NIGERIA. Hi all, this hub is awesome as it is still trending. Many thanks to brandon. No, it was very clear. You linked to Glenn´s article so that is what I used to make my TOC. Nice. It's good to know that the editors also make this change. Wasn't it made clear in my article that a table of contents must be linked to the relevant section? If not I need to go through it again. It was moved over to Pethelpful today, and the editor agreed with you since she put my FAQ into a numbered list (but still hyperlinked within the article as explained in Glenn´s article). I do not want to change it since her editing has improved so many of my articles. Cool, looking forward to knowing how you rank for those. Looking back, as we are always so prone to do, I think I could have used the questions as subtitles and then used a numbered TOC like you suggested. I went ahead and published yesterday anyway with the questions as my TOC. I will let you know how this works out. In your case it won't be right to have a numbered TOC. But, as I mentioned in the article, as of now, Google only seems to be using numbered TOC's as sub-links before the meta description, etc. I would have a regular TOC with a bullet list if I were writing a hub such as the one you mention. Hmmm, I wish I had a special Batphone with a red hotline to Google! I would have so may questions. I was curious about the numbers because I read one of Glen´s articles without a numbered TOS, and the current TOS I am working on is a series of questions (and the answers are in individual capsules deeper down in the article) that may not lend itself to being numbered. A reader could ask their question in search, Google would show them my article, then they could click on the internal hyperlink at the top of my article and jump right to the info they are looking for. This is so helpful and thank you for writing it, Brandon! I have already bookmarked it so I can read it in chunks. I just finished reading the first chunk and am looking forward to reading the rest. @Dr Mark. That's a question you need to ask Google :) its just what works best based on statistics. Why does the TOC always have to be a numbered list? Hi,nomadspirit. no writer on HubPages will like to ignore such excellent practical tutorials. I am still thankful I read the story. It's a great help. Hey Jeff I can imagine it was a long read. You're welcome. Nice to hear that Eric. Good luck! Thanks for the guide. Some of the things you mention are concepts I thought of using, but I never could think of a good way to do so. This guide is a neat structure I can follow, and I will use this to try to write better hubs in the future. This is quite a hefty read but worth every minute.I have gained precious insights from the article.Thanks. Thanks for the feedback Glenn. I do not disagree with you on what you say regarding the QnA bounce rate etc. I'm just pointing out that keyword cannibalization is a thing when using the QnA feature. If you know how to change the keywords etc. it's no issue and can be a good thing. But most people don't realise this. Personally I prefer to target synonyms through my hub and not through the QnA feature. 9 months ago from U.S.
Wow, great job with this guide BrandonI I bookmarked and will be returning to reference it since it’s packed with so much helpful information! Thanks. Hi Kierstin, good to know. I will re-read where a table of content is necessary. That can improve my hub traffic. Wow, we should all bow down before your incredible expertise. I appreciated reading this and learned a lot. Awesome! Brandon, you're so smart! Thanks for writing this - I can't wait to read it all of the way through and I'm going to start putting a table of contents into all of my already-published hubs now. Great work Brandon! I see people complain a lot on the forums that they have to always make changes. They think they can write it and forget it. But you made it clear, right up front, that writing online content is not a passive business. I’ve been always working on older hubs to keep up with the latest requirements imposed by Google. Your guide is a great reminder of the things that can help improve SEO of our hubs. It’s a guide to a process that everyone should use and reference more than once. I know I will. You are proof that the process you describe actually works, and works well, because you have over a million views on just a handful of articles. On the topic of the Q&A, you talked about keyword cannibalization by answering questions already discussed. I have answered such questions, but in order to avoid the cannibalization issue, I have always answered in a different way, and with different keywords, than the way I wrote the content in the original article. I have to disagree with what you said about not helping lazy people. The redundancy can work in our favor if we do it right. We just have to be careful not to use the same keywords in the Q&A. Here’s my experience . . . I get more traffic coming from the Q&A to the main article. I see this in my Google Analytics, which shows me zero bounce rate on many Q&A. I never saw zero bounce rate one any hubs! A zero bounce indicates that people are not returning to the SERPs. They either have been satisfied with the answer, or they have been clicking on the link to the article after reading the Q&A answer. GA Behavior Flow shows me that 75% of the people follow the link from Q&A to the hub. I do agree with you about the problem that some people write Q&A answers in a low quality style, and that they don’t change the question text to avoid keyword duplication with the main article. Those pages can hurt us, especially being that they are on the niche sites. It’s important to improve the text of the question when answering them. I’ve been working my way through your guide the last few days, and made some changes to a few hubs with better main images with improved captions for Pinterest and for Google images. Thanks for bringing that to my attention. Hey Liz, all of us have been there as you can see from the really bad URL I have in one of my examples. I'm happy the guide was of use and good luck working on your hubs. This is an incredibly useful article and one which, as a relatively new hubber, I shall refer back to in the future. I had written more than one article before I realised that the URL is taken from the initial draft article. I live and learn! Thanks for the feedback and appreciation Krzysztof. I can imagine that it's quite a read. Just reading through it to edit it took like 2 hours or so. Good luck working on the hubs you want to revamp. I hope you can put this guide to good use. Wow that was quite a read, so much information to take in with topics I've never even thought about. I'm currently trying to revamp many of my hubs and this is a great tool to look back on. It would be wise for any Hubber to read this guide. Hi Arby, glad you found the hub. You do have some really good hub titles, many How - To's they usually do well if you follow the method I outlined. Yes, HP has gone a long way and the niche sites are really good. You should definitely work on getting all your hubs moved to the niche sites as that is where you will do well. Having a hub on HubPages does not really bring in any traffic. If you ever have questions in the future when you re-read the hub, feel free to ask. Good luck and welcome back to HP. Hey Leland, luck does play a huge part when you write online because there are always chances of a great article, one that is very well optimised for search engines does not rank, just because the competition gets a lot of backlinks. If you have any specific questions feel free to write a comment again and I'll do my best to clarify it. If you've got hubs that are already doing well, it's best to begin working on those articles as they have the potential to get even more traffic. Good luck. I came here after peeking in on your thread in the forums. Thank you so much for taking the time to put this together! I used to dabble with hubs many years ago and decided to check back in recently. I like what has happened in my absence, and am working on overhauling all of my old hubs (or at least the ones worth doing that with) before I move on to creating some new ones. I can't understate how helpful this information has been. I've bookmarked this hub as I'm sure I'll be returning for reference many times. Again, thank you! Brandon- Excellent article, but I'm having trouble wrapping my head around it. I wish we could sit down and have you explain it to me. I'll read the article again and visit the sites you recommend. It seems like my highly trafficked hubs are merely a result of luck. Katy, I'm glad you found it useful. Yes, with strong niche sites it is very easy, relatively speaking to rank for medium competition keywords. Many people do not take into account keyword cannibalization, that's a big mistake in my opinion. Yeah, it was an eye opener realizing that lengthy hubs covering many sub-topics does not rank as well as I expected it to. So word count is not as much a positive factor as I had imagined. Brandon, this is a very useful guide! I learned a lot of new ideas to implement. That's on top of the wisdom I've gleaned from your comments and others' on the forums. Some good cautions on keyword cannibalization. I often overlook that. Also an interesting insight into Google not ranking an all-in-one authority site for its sub-keywords. I agree that eventually it will be smart enough. But it's good to know that it's not worth writing articles structured like that yet. For me personally this guide shows its possible to get hubs ranked well for any niche subject I'm expert enough to write on, I think that's pretty amazing! Great stuff! I'm no beginner writer, having done political advocacy letters, call script writing, and blog posts for various platforms. However, my SEO skills are not where I want them to be. I'm digging into this heavily now and think this guide will prove useful for many writers like myself. Thanks for the thorough explanation on your thought processes. It takes some of the mystery out of it for me. I'll be referring back to this. Thanks for the feedback Robie, glad you found it useful. Hey Dr Mark, at those traffic stats I would definitely just begin a new hub on a better URL and work on getting it moved to a niche site and eventually it would get a lot more traffic than 10 a month. Also, when you start with a new URL other than the obvious benefits, it would directly be considered for a niche site. There are no downsides of featured snippets, just that if you don't own it, you are losing out on a lot of potential traffic. Featured snippets do at times answer the users query and therefore they have no need to read your hub, but I would rather have it and lose some traffic than not have it and lose even more. One of my hubs still on HP main site has a poor URL; the keyword only gets about 10 searches per month. The hub almost always has 0 page views per day. In order to get the article moved to a niche site, I will need to do a lot of editing and add more info. I am wondering if you think it would be better to just delete the article (since it is not even on a niche site yet) and start with a new and more useful/popular URL? I could then add the info from this old hub to the new hub. Interesting article. What do you think of the downside of the featured snippets? It is always best to steal the snippet? Thanks for all of the hard work. As always you have provided us all a lot to work with. Hi all, no serious hubber can neglect such a useful guide. Thanks a lot for putting in the time to write this guide! Lots of great stuff! Hi Venkat, glad you found it useful. You're welcome. Brandon, this is a wonderful guide. Very useful and informative with deep analysis of the entire process. I need to visit it many times to digest everything. Thanks a lot. Hey Reginald, all you need to do is pick the hub that is doing the best and work on it to make it better. If it's already getting a little traffic from Google you can get a lot more with a little focused hard work. What a great article you wrote. Great information that I really appreciate and will use to build on my education of blogging and writing articles. Presently, I can only see between 10 - 20 views daily and need to find ways to increase the traffic to my posts. Hi Brandon, I have begun to put your suggestions into action. I am at the moment editing one of my hubs. Thanks for responding this soon. Hi Miebakagh, you're welcome and good luck. Hi Brandon, very interesting and information article. I wil limplement the suggestions.